Discover Galicia’s fairytale charm; the old town of Santiago de Compostela, white beaches, roman city walls, charming winding streets, delicious seafood and rugged coastline. Combine the holidays with wonderful spa and wellness facilities, golf, fishing, cycling, hiking and many other activities. Galicia has it all and is ready to welcome you. With the Spain is More guidebook in hand, we assure that you will discover the best of Galicia. Porto is the city which has given its name to both the country Portugal and port wine, and it is Portugal's second largest city after Lisboa. The city, also known as Oporto, is an ancient city with a foot firmly in the industrial present. The old towncenter on the hills overlooking the Douro River is today UNESCO World Heritage Site. São Francisco Church from the 14th century is one of the city's major attractions, as the local port wine cellars, most of which is located in Vila Nova de Gaia on the other side of the river. An exciting city in which we can recommend to take an overnight or two more if the time is right . Historic monuments,the beautiful location and of course the portwine, are some of the reasons to visit the city. An exciting city in which we can recommend to take an extra day or two if you have the time. Accommodations: Charming hotel with pool close to Sanjenjo. The Rias Bajas coast is rich in adventure and magnificent scenery. The climate is pleasant all summer, making this a popular vacation destination for Spaniards. The area sports some of Spain’s best beaches — one recently voted the world’s most dazzling. Take the opportunity to explore the small vacation and fishing towns along the coast that oozes charm. The whole region is immersed with pleasant atmosphere, beautiful scenery, and simply invites indulgence. Accommodations: Charming hotel at the Rias Altas coast. There are many interesting stops heading north from Sanjenjo, but Santiago de Compostela is mandatory! The end station for the pilgrimage route, “Camino de Santiago” is a veritable cornucopia of attractions and one of the world’s most important cultural centers. Santiago de Compostela exudes charm and has a myriad of cozy streets, where there is ample opportunity to sample the many local specialties. Its old town is hard to match. Surrounding the cathedral is the historic center, which is on UNESCO’s World Heritage Site list. You'll find its monuments are real pieces of art in different architectural styles. In Santiago, eating is an important aspect of the culture. A wide variety of cafés and bars give life to the center, and restaurants lure patrons with fresh seafood displayed in the windows. As always in Galicia, the quality is very high. 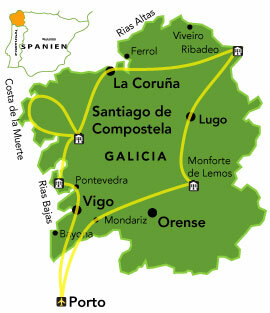 Santiago de Compostela is a good starting point for excursions to the fabled “Costa de la Muerte” (Death Coast). This coastline is full of rugged, jutting rocks echoing with numerous hauntings of shipwrecks and those caught in its precarious, natural beauty. Among the rocks at the “World’s End” are idyllic fishing villages and sunsets, said to be some of the most unreal on earth. Interesting small seaside towns have adapted to life on the jagged coast, and offer glimpses of the original Celtic culture and ancient fortifications. La Coruña has rich history as an old fishing and commercial port on the Atlantic. The narrow roman streets, squares and medieval churches are captivating to all. The big aquarium and alluring science museum are certainly worth visiting. As the trip continues to the east, the coastline of the Rias Altas offers a number of picturesque monasteries, churches and medieval towns, a complete and unique experience in combination with the harsh natural harmony. In the small fishing villages, restaurants invite patrons to sample the traditional cuisine of freshly caught seafood. Later, you will see one of Spain’s most spectacular beaches as well as one the most photographed locations throughout the Galician Coast. During the trip to beautiful Ribeira Sacra, you enjoy a view of one of the best preserved Roman city walls in Spain. Ribeira Sacra is known for its natural beauty, and in recent years, for its red wine production so be sure to visit a few of the best "bodegas" while you're here. The Sil River meanders peacefully through a 500 m (1640 ft) deep green canyon, rising steeply on both sides. A cruise on the river is a life experience, and it will help you comprehend the difficult conditions facing local wine producers. Views from the sailing excursion include remarkable monasteries which are often hidden on remote hillsides in deep forests. These monasteries gave the area its name, “the sacred riverbank”. From 695 EUR/pers. Per person in a double room. 7 x nights in double room in stunning hoteles selected for their quality, location and authentical charme. Car rental from Porto airport - Category: Ford Fiesta, Renault Clio or similar (inclusive unlimited mileage, taxes and basic insurance). River cruise on Rio Sil. Personalise your holiday: Extended stays, transportation to startingpoint from anywhere in the world and back, add interesting and authentic experiences etc. Please ask us, we will be happy to assist you. Carrental: Please, ask for price, if you prefer a different category. The price include 1 Spain-is-More-Travel Guidebook per every 4 travellers. More copies can be purchased when booking for 20€/copy, or 30 euros/copy if you ask for it with less than 6 weeks prior to departure.